Last night we completed our competition team series at Paula and Judy’s Dance Connection. This is a great set of images of the various competition numbers, taken in high-key style on a white background. We had a very smooth evening of shooting and we came away with some excellent images! 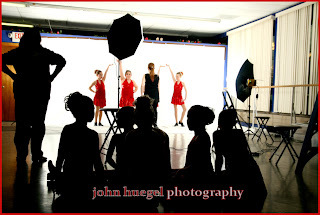 Great posing and creative ideas from the studio owners and the girls were very cooperative. Here’s an image of the act in progress, shot from behind the set in the studio. I thought the silhouettes of the waiting girls in the foreground added an interesting element to the image.